Third Base Politics: DNC Showing True Colors With Latest "Mistakes"
Democrats and political analysts alike have talked about the opportunity that this week's convention provides for the party to lay out their plan for the country. As such, they have gone to great lengths to carefully script the week's events. In a rare moment of actual convention drama, Democratic officials reinserted language back into their official platform Wednesday evening that invokes God and affirms the role of Jerusalem as the Israeli capital, trying to defuse Republican attacks over the party’s stances. But the maneuver may have backfired, infuriating delegates who objected to the changes. So Democrats drafted a platform without any mention of God (despite His many references in the Declaration of Independence and other founding documents of our great country) and without acknowledging Jerusalem as the capital of our greatest ally in the Middle East. Wonder how that happened? Oh, right. Ted Strickland strikes again! Turns out Ohio's failed former governor was the chair of the Democrat's committee tasked with drafting this year's platform--but you would think a minister wouldn't forget to acknowledge our Creator. Of course, that's just one blunder. Democrats' omission of Jerusalem--the capital of a nation whose founding is one of the greatest victories in modern history--goes beyond a mere oversight. In the words of our vice president, that's a big f***ing deal. Kudos, Teddy. That's one heck of a screw up. Even your Democrat allies are calling it "embarassing." But what's even more disturbing is this trend of Democrat "mistakes." And now omitting God and Jerusalem. At what point do these go from "gaffes" and "mistakes" to actual beliefs and values? Just look at the video above--a good half of the DNC strongly objected to putting God and Jerusalem into the platform. That doesn't sound like a simple omission. That's deliberate. Take a good, hard look, America. You're getting a glimpse at the real Democrat party. Holy cow. 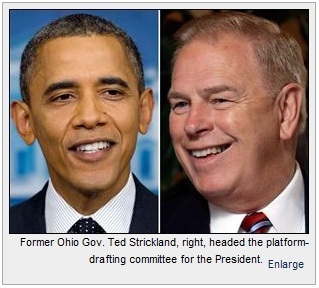 Ted Strickland embarrasses himself AGAIN. This time on the national stage. Is there anything he can't screw up? Think of a conversitive, and I take away reason and accountability.